All of us, at one point or the other, have tried to find symmetry in Ravanaa��s line-up of 10 heads. A count of 11 would have been just perfect, leaving five on either sides, isna��t it? 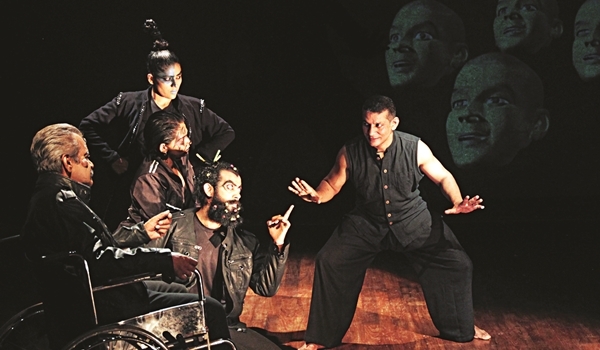 Beginning today, the Adishakti Laboratory for Theatre Arts Research will delve deeper into this figurative (and even psychological) crisis in its play The Tenth Head at Jagriti Theatre, where a total of 11 shows will be staged. Scripted by Vinay Kumar KJ and directed by late Veenapani Chawla, it shows the tenth heada��s dissatisfaction with the other a�?averagea�� nine and his constant urge to stand out as the better one, a�?who has a mind of his owna��. So, he invites four talented artists to help him either fit in graphically and physiologically or be hailed as separate. Kumar, who plays the tenth head, explains, a�?Ita��s the story of one head against the collective of nine others. He either wants to be independent in his thoughts or actions, or, achieve an equitable relation with the collective. What we are trying to show is that there are usually two voices in our heads. One is our own rational thinking and the other one is weighed against the system of social justice and morality, which prevents us from doing certain things in life.a�? Right in the beginning, the tenth head expresses his desire to Sita to lead a life independent of the nine (depicted by projection). They, according to him, conform to a common line of thought. For instance, the nine heads are fascinated with Lord Kubera, his airborne magic chariot pushpak vimana and the implications of owning a flying machine. The tenth one, however, has romantic notions about a�?flighta��. His equation with Sita is also different, which will be further explored in the companya��s next act, Sita. In fact, The Tenth Head happens to be one of the three plays that came out of Adishaktia��s three-year-long Ramayana Festival held at their Puducherry campus. It premiered two years ago in the city, travelled to Mumbai and Chennai and has since been reworked into a�?almost newa��. It would be quite interesting to see who cracks the puzzle first a�� the artists or the tenth head himself. And, how.